Thanks to our ability to learn and to remember, we can perform tasks that other living things can not even dream of. However, we are only just beginning to get the gist of what really goes on in the brain when it learns or forgets something. What we do know is that changes in the contacts between nerve cells play an important role. But can these structural changes account for that well-known phenomenon that it is much easier to re-learn something that was forgotten than to learn something completely new? Scientists at the Max Planck Institute of Neurobiology have been able to show that new cell contacts established during a learning process stay put, even when they are no longer required. The reactivation of this temporarily inactivated "stock of contacts" enables a faster learning of things forgotten. While an insect still flings itself against the window-pane after dozens of unsuccessful attempts to gain its freedom, our brain is able to learn very complex associations and sequences of movement. This not only helps us to avoid accidents like walking into glass doors, but also enables us to acquire such diverse skills as riding a bicycle, skiing, speaking different languages or playing an instrument. Although a young brain learns more easily, we retain our ability to learn up to an advanced age. For a long time, scientists have been trying to ascertain exactly what happens in the brain while we learn or forget. To learn something, in other words, to successfully process new information, nerve cells make new connections with each other. When faced with an unprecedented piece of information, for which no processing pathway yet exists, filigree appendages begin to grow from the activated nerve cell towards its neighbours. Whenever a special point of contact, called synapse, forms at the end of the appendage, information can be transferred from one cell to the next - and new information is learned. Once the contact breaks down, we forget what we have learned. Although learning and memory were recently shown to be linked to the changes in brain structure mentioned above, many questions still remain unanswered. What happens, for example, when the brain learns something, forgets it after a while and then has to learn it again later? By way of example, we know from experience that, once we have learned to ride a bicycle, we can easily pick it up again, even if we haven’t practiced for years. In other cases too, "relearning" tends to be easier than starting "from scratch". Does this subtle difference also have its origins in the structure of the nerve cells? Cell appendages abide the saying "a bird in the hand …"
Scientists at the Max Planck Institute of Neurobiology have now managed to show that there are indeed considerable differences in the number of new cell contacts made - depending on whether a piece of information is new or is being learned second time around. 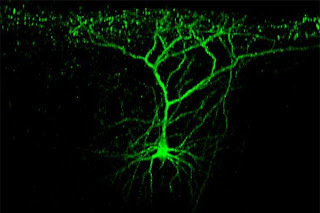 Nerve cells that process visual information, for instance, produced a considerably higher number of new cell contacts if the flow of information from their "own" eye was temporarily blocked. After approximately five days, the nerve cells had rearranged themselves so as to receive and process information from the other eye - the brain had resigned itself to having only one eye at its disposal. Once information flowed freely again from the eye that had been temporarily closed, the nerve cells resumed their original function and now more or less ignored signals from the alternative eye. "What surprised us most, however, was that the majority of the appendages which developed in response to the information blockade, continued to exist, despite the fact that the blockade was abolished ", project leader Mark Hübener explains. Everything seems to point to the fact that synapses are only disabled, but not physically removed. "Since an experience that has been made may occur again at a later point in time, the brain apparently opts to save a few appendages for a rainy day", Hübener continues. And true enough, when the same eye was later inactivated again, the nerve cells reorganized themselves much more quickly - because they could make use of the appendages that had stayed in place.